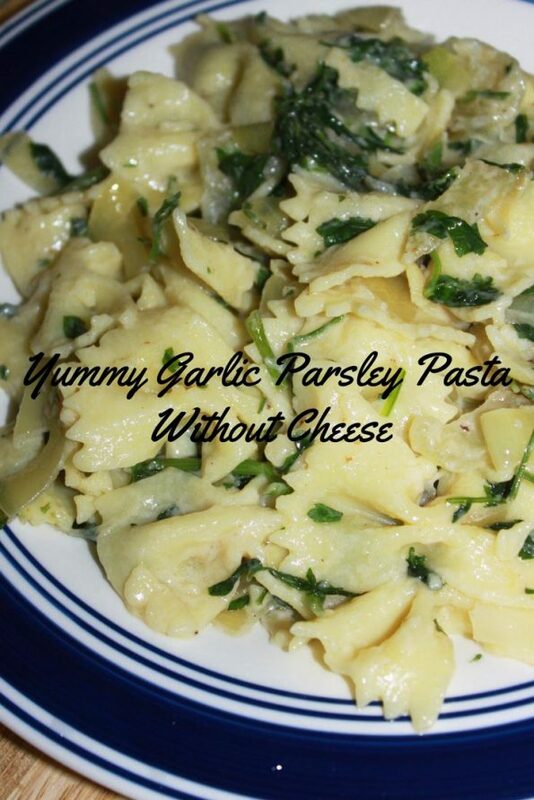 This garlic parsley pasta recipe is easy, delicious, healthy, vegetarian and cheese free. You can make this garlic parsley pasta along with easy homemade white garlic sauce for an easy vegetarian lunch, brunch or dinner. 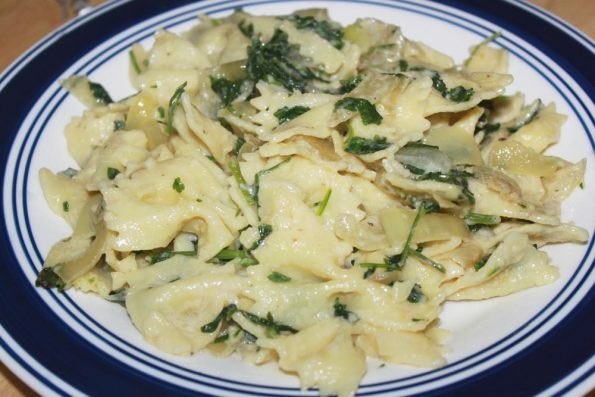 Fresh flat parsley leaves is the main ingredient in this easy vegetarian pasta recipe. 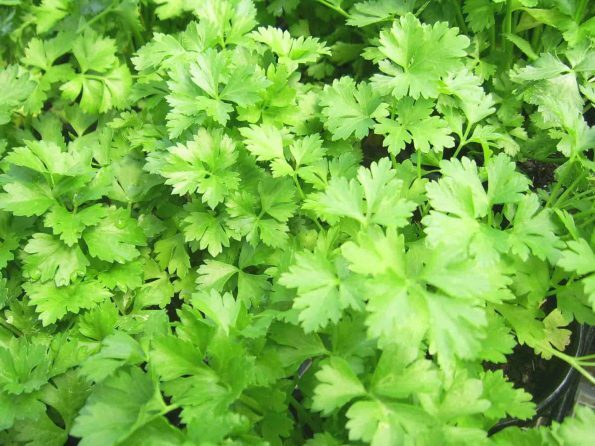 Parsley leaves are full of flavor and you can chop them up in a matter of minutes to add them quickly to dishes. They are very healthy as they are packed with lots of nutrients and antioxidants, and adding them in pasta is a very easy and tasty way to include them in your diet. I have used fresh flat parsley leaves for this recipe but you may also try dry parsley flakes (you have to use less amount if using dried leaves though). We use fresh garlic in this parsley pasta along with white garlic sauce which is flavored with white pepper powder. The fresh garlic in the pasta and the garlic powder in the sauce make this pasta a very delicious one with the goodness of lots of healthy garlic in it. I also used onion, crushed ginger and garlic cloves to add more flavor to the pasta. The sauce I tried is a basic white pasta sauce made of just butter, flour, milk and salt with some added powdered garlic and white pepper. You can read all about the white garlic sauce recipe here which I used for this pasta recipe. The pasta sauce is very easy to make and delicious and it perfectly blended with the garlic flavored parsley pasta. 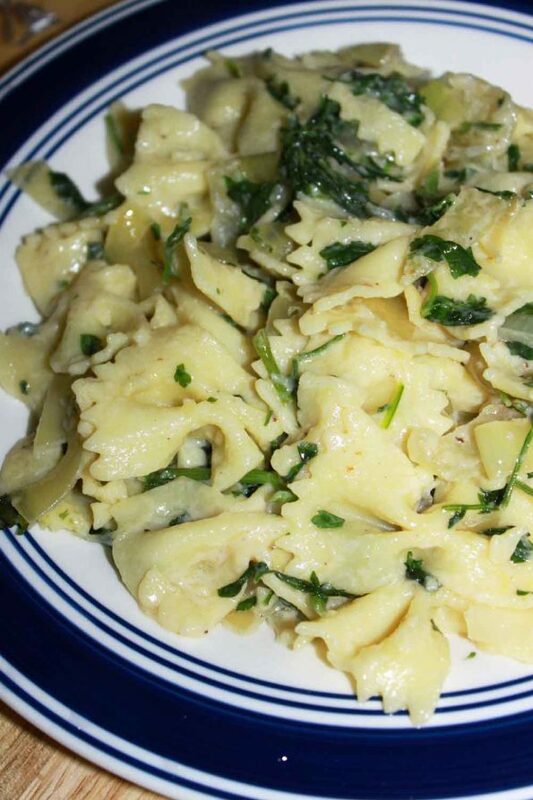 So here is how I made the parsley pasta following this easy garlic parsley pasta recipe. Garlic parsley pasta is full of flavor from the fresh herbs used and it is very easy to prepare too! I made this vegetarian pasta dish without using any cheese, and it was very delicious with the white garlic pasta sauce I used with it. However if you wish, you may add cheese too. 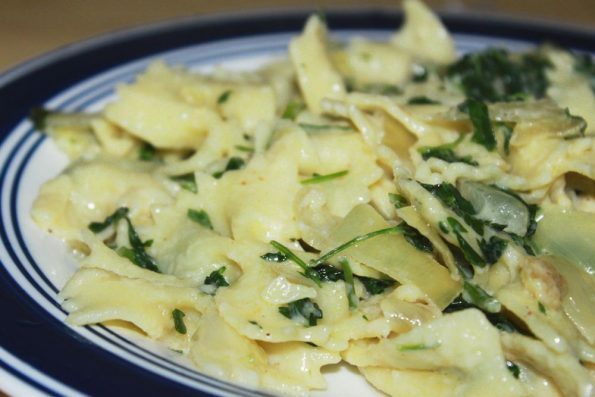 This pasta recipe is a good way to use any fresh parsley leaves from your garden or if you have any leftover parsley with you. Cook the pasta according to the instructions in the packet, drain and keep aside. You may drizzle little oil and stir once so that the pasta shells won't stick to each other. Chop the onions, crush the garlic and ginger. In a heated pan, add oil and fry the garlic and ginger, add the chopped onions and fry till tender. Meanwhile chop up the parsley leaves finely and keep aside. Once the onions and cooked, add the parsley leaves, add the butter and salt and fry for another 2 minutes. You can also cover the pan and cook the parsley onion mixture for another 2 more minutes if you don't want a strong flavor of parsley. 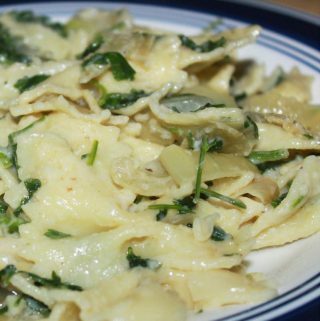 Once the onion parsley leaves mixture is sauteed well, add the cooked pasta and mix well. Pour the sauce to the pasta and mix the pasta gently so each pasta shell is coated with the white sauce. 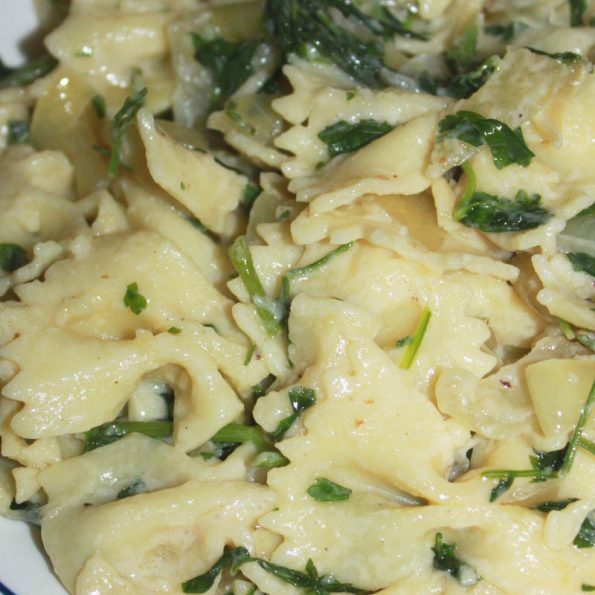 Serve and enjoy the delicious and simple parsley pasta with white sauce! You can add grated cheese on top of the prepared pasta if you wish, though I didn't use any cheese in this pasta dish as it was already very delicious without the addition of cheese. The white garlic sauce I used for this pasta makes this pasta very creamy and more delicious. To prepare enough sauce for this dish, you will need to increase the ingredients in the pasta sauce recipe accordingly. 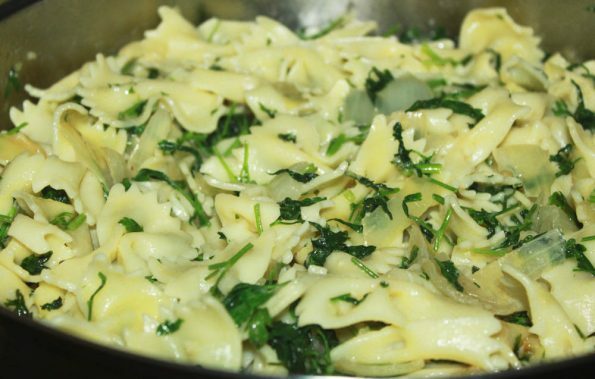 As you can see below I used the bow tie shaped pasta, which is also known as farfalle pasta to make this parsley pasta. You may also use other shapes of pasta if you wish. 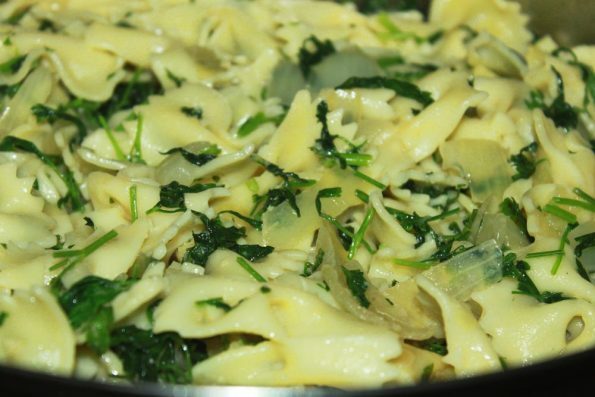 The cooked pasta is mixed with the goodness of fresh green parsley leaves and onions. The addition of simple and easy homemade white garlic sauce makes the parsley pasta creamy and more delicious! You may add more pasta sauce to the prepared pasta if you wish, to make it even more delicious and top with cheese if you desire, though it is already very delicious even without the cheese! 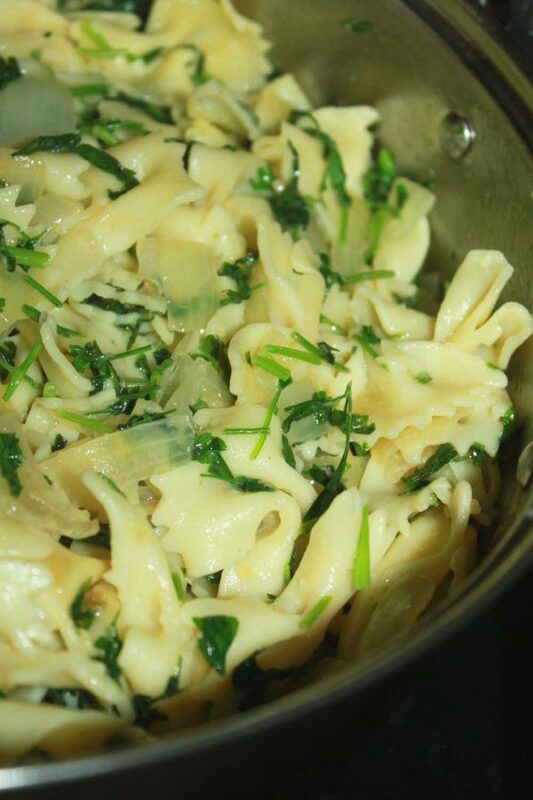 Hope you found this post on garlic parsley pasta recipe helpful in making easy and delicious garlic flavored parsley pasta for a delicious lunch or dinner!